Dreams, adventure and memory are just a few of the themes that Nicolay Dance Works explores in its newest dance creation—“Beyond!”—being presented on Feb. 28 at Old Town Theatre in downtown Huntsville. 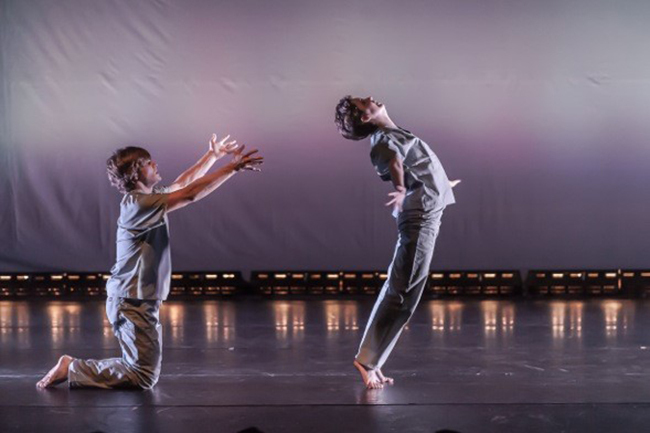 Featuring fluid, dream-like choreography, “Beyond!” embraces surreal themes with rich characters that standout among the pieces, often providing a narrative for audience members, according to Dana Nicolay, SHSU professor of dance and founder and artistic director of Nicolay Dance Works. In “Dream Birds,” dancers flow seamlessly in and out of graceful lifts, demonstrating mastery of strength, balance and control as they create an imaginative dream environment. The daring and adrenaline-charged work, “Free Fall” creates feelings and visions frequently remembered from our dreams of falling or flying. Also among the dances is “Early Retirement,” a solo piece performed by Cody Miley, in which choreographer Nicolay delves into his family’s own past with a monologue dance that explores his father’s personal life and career. Other works on the program include "Sabachthani," a work for six men that explores the implications of the Easter story; and "Hands On," a duet to the music of Peter Gabriel, among others. Now in its second year, Nicolay Dance Works currently features 11 artists studying dance at Sam Houston State University. Nicolay established the Huntsville-based dance company as a part of his vision to bring approachable dance to Huntsville’s growing artistic community. “Huntsville has a strong base of supporters and patrons who appreciate new and fresh artistic offerings and they don’t necessarily want to go to Houston to get that,” Nicolay said. By presenting new works in Huntsville, Nicolay is hopeful that it will also help new audiences identify how dance as an art form can express meanings and feelings regarding the human condition. Drawing on his international background in ballet, contemporary dance and Laban movement analysis, Nicolay strives to create dances that speak clearly and truly of human experience. His body of nearly 50 concert works has produced numerous awards and recognitions from organizations such as the American College Dance Festival Association, Regional Dance America, and the Mid-America Dance Network. He pursues an active freelance career as a teacher, choreographer and adjudicator. He holds a Master of Fine Arts degree in modern dance from Texas Christian University and is a certified Laban/ Bartenieff movement analyst. Tickets are available for $10 for advanced purchase at nicolaydanceworks.com.